The digitalization of design is closing the gap between the representation of architecture and its materialization. As fabrication becomes more digitalized, geometric constraints vanish, and the fabrication process is no more difficult than traditional rendering. With the potential resolution increasing on both the design and fabrication side, the divergence between the visual and the material will cease to exist. This increase in resolution opens up new perspectives not only for a rational construction of buildings but also for the creation of new spatial sensations in our built environment. In the project Digital Grotesque, we explore this new opportunity by combining algorithms to design architecture with large-scale 3D printing for its production. The result is a luxuriant architecture with an unseen richness of detail. In the Digital Grotesque project, we do not design form with pen or mouse, but instead write a subdivision algorithmic to generate the form. Such a procedural approach allows the articulation of highly differentiated forms at multiple scales: a simple input form is divided again and again until a unique topography evolves. The results are geometries composed of hundreds of millions of individual facets, interweaving with space and forming patterns whose origins are impossible to deduce. 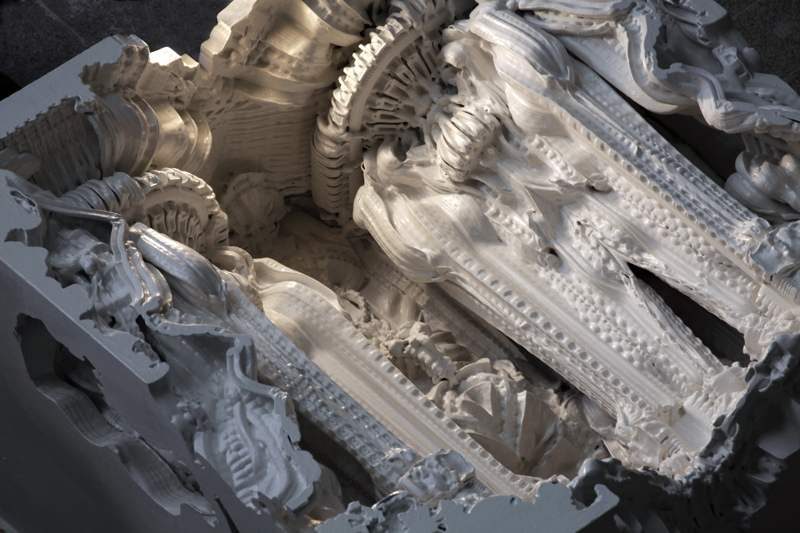 If one compares the fabrication of architecture with the process of paper printing, then we are about to shift from a standardized typeset to a digital print. 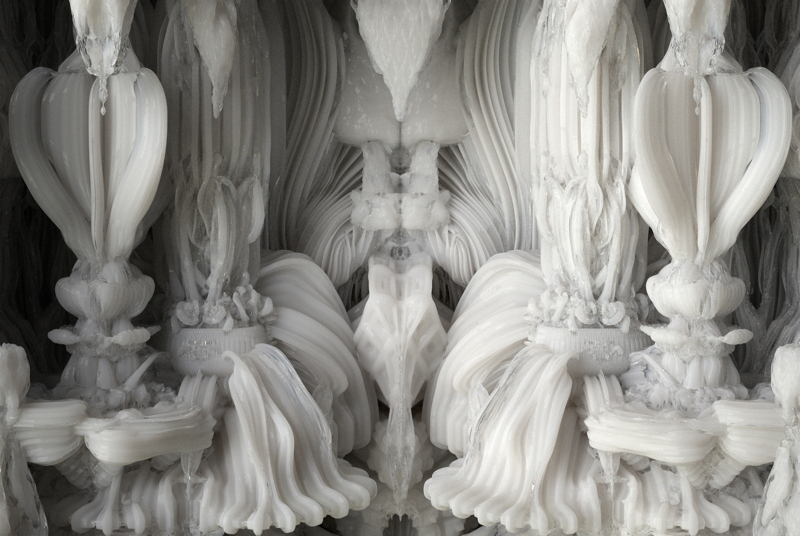 3D printing is the first fabrication technology that is entirely digital at its core. It is based on the tectonic of microscopic elements, for example grains of sand. 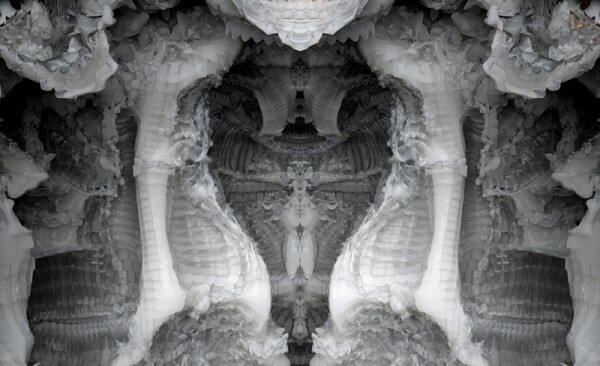 3D printing now appears to be mimicking previous developments in paper printing: While the first machines could only distinguish between inside and outside (black or white), now even gradient combinations of multiple materials (colors) can be freely composed in space. 3D printers are now reaching dimensions adequate for full-scale building components, and they are turning into a compelling alternative for the fabrication of architecture. They allow the production of complex building components without geometric constraints in an extremely high resolution. One can use this resolution to formally emulate the heterogeneous aesthetics of natural materials, or to formulate new ones. But the geometric freedom also allows for the synthesis of material properties on a functional level. Volumes can become porous where less material is needed, or massive where a higher compression is expected. Hollow parts may provide a better insulation, less weight, less material. Printed microstructures can locally control the structural or climatic behavior of components. By pushing the limits of resolution in design by “writing” code and in fabrication through “printing”, we seek to create novel spatial sensations and to provide a new way of “reading” space. Instead of consisting of flat single surfaces, the walls of the room intermesh with the space, creating multiple layers of solids and voids. This enables a maximum of communication with the environment: the geometric structures and the complex topologies afford manifold perspectives. Intricate shadows modulate the light, and differentiated tactile perceptions await the visitors. Architecture not only provides shelter, but always communicates with us. Digital technologies in both design and fabrication now provide us with a new medium for architectural storytelling in an unseen density of information. The Digital Grotesque project is the first of such geometric narratives. Michael Hansmeyer is an architect and programmer who explores the use of algorithms and computation to generate architectural form. Recent projects include the Sixth Order installation of columns at the Gwangju Design Biennale, as well as the design of full-scale 3D printed grotto for the 2013 Archilab exhibition. He is currently based in the CAAD group at the Swiss Federal Institute of Technology (ETH) in Zurich. He holds a Master of Architecture degree from Columbia University and an MBA from INSEAD Fontainebleau. He previously worked for J.P. Morgan and McKinsey & Company, as well as at Herzog & de Meuron architects. Benjamin Dillenburger is an architect and programmer with a multidisciplinary research focus on computational design and fabrication methods for architecture. He is assistant professor at The John H. Daniels Faculty of Architecture, Landscape, and Design at the University of Toronto. He previously worked as senior researcher and lecturer in the Computer Aided Architectural Design group at ETH’s architecture department in Zurich. Benjamin Dillenburger holds a Master of Advanced Study degree from ETH Zurich and a Master of Architecture Degree of the TU Kaiserslautern. He is also member of the studio KAISERSROT, an interdisciplinary consulting & design team exploring the potential of computational design for architecture and urban planning.